South Korean design is always innovative and savvy, which is why this fabulous little home by design professionals, Hangul House, is no exception to the rule. With limited space available to them, the designers have ensured that they have maximised every square inch, creating a home that seems spacious and bright despite the limited square metres. As we explore this home inside out, we will also see how effective a minimalist design is and how simple is sometimes the most stylish. 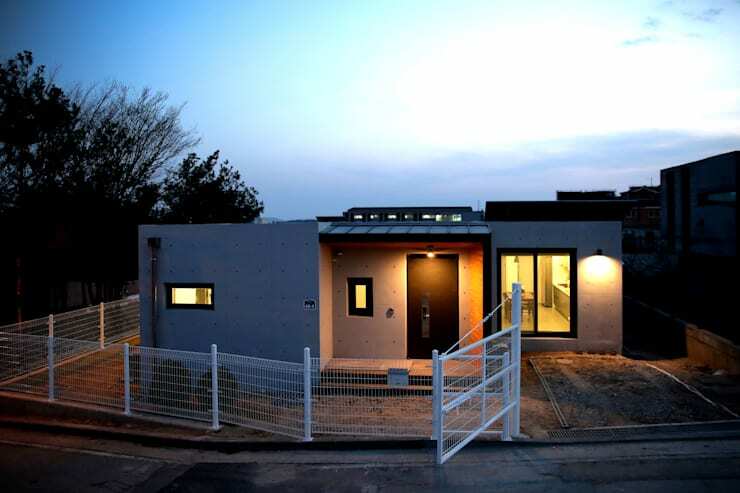 From the outside of the home, we can see that it is a neat little block shape, packaged away tidily by a flat roof. The designers have gone for white and black tones, creating a striking look and feel throughout the exterior. Each section of the home is made up of different volumes and shapes, coinciding with the uniquely shaped windows that are featured throughout the facade. The result is an eclectic design that is as interesting as it is quirky. The lighting plays as much of a role as the facade itself, illuminating certain details and designs. This is functional too, allowing the family to see where they are going as they make their way to the front door at night. This is a great design tip! Have a look at these outdoor lighting ideas for modern houses. From the moment that we step into the house, we can see how it takes on a chic and minimalist look and feel. The living room features a gorgeous design, but you'll notice that it doesn't include anything that isn't functional. In fact all that is in this living room is a sofa, rug, coffee table and cupboard. The cupboard is an excellent addition to this space, ensuring that all items such as remote controls, chargers and books can be stored neatly out of sight. 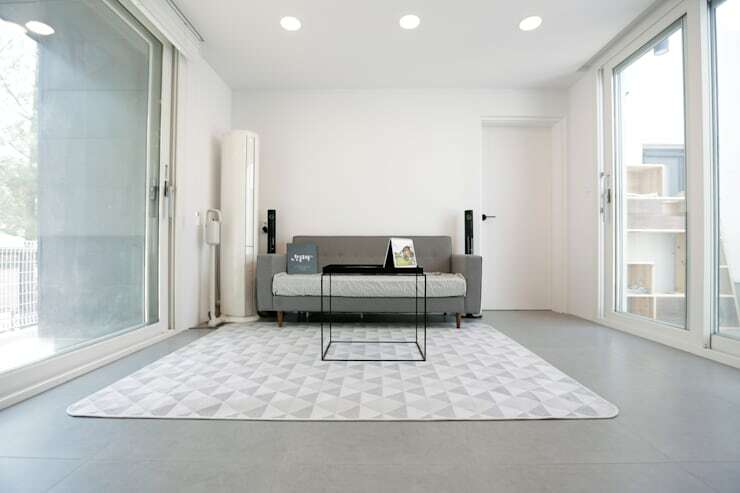 The grey and white tones contribute to this sleek and minimalist look and feel, while the soft rug adds a touch of comfort and homeliness. 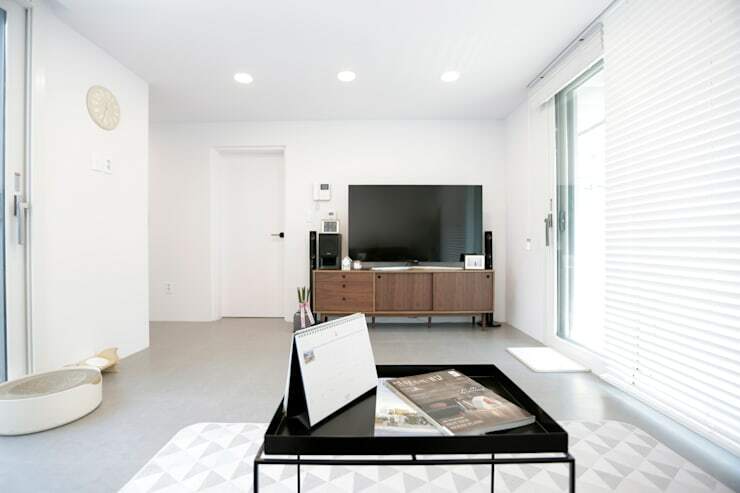 If we look at the living room from the sofa, we can see that the designers have included a large flat screen television as well as a television cabinet. This is a home that is as savvy as it is sleek! On the right, the large glass windows and doors allow sunlight to stream into the home. The white walls reflect the light back on itself, making the home seem very spacious, bright and light. The white tones are broken up by the darker furniture, while the ceiling lights ensure that there is plenty of ambiance and functional light in this room in the evening. The kitchen and dining room flow into one another, creating an interactive and social space for the whole family. 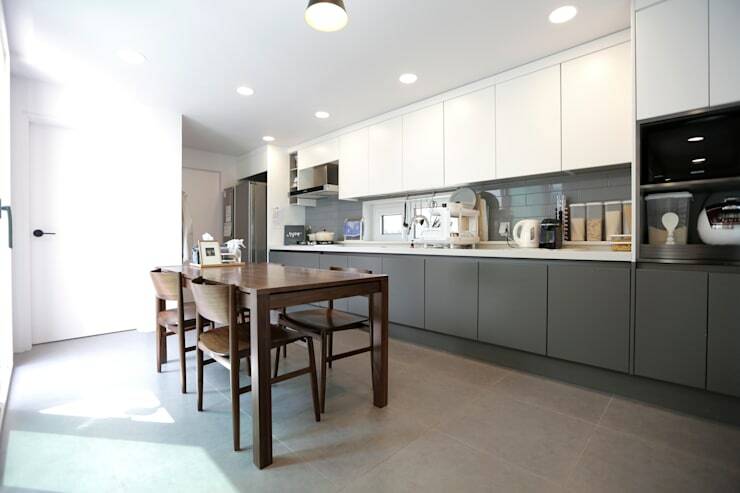 The grey and white kitchen cabinets and shelves contrast beautifully with the authentic wooden dining room table, while the screed flooring gives this space a very edgy look and feel. Remember that when you have a small home, you don't want to cramp the rooms by having too many walls that separate them. An open plan flow makes the home seem that much bigger. Have a look at these tips: how to stylishly split a room without a wall. Despite a limit when it comes to space, the designers have still found room to create an office or home study, which is brimming with books! The shelves that line the walls take up very little space in terms of square metres, but offer plenty of room for keeping books, files and other items stored neatly away. 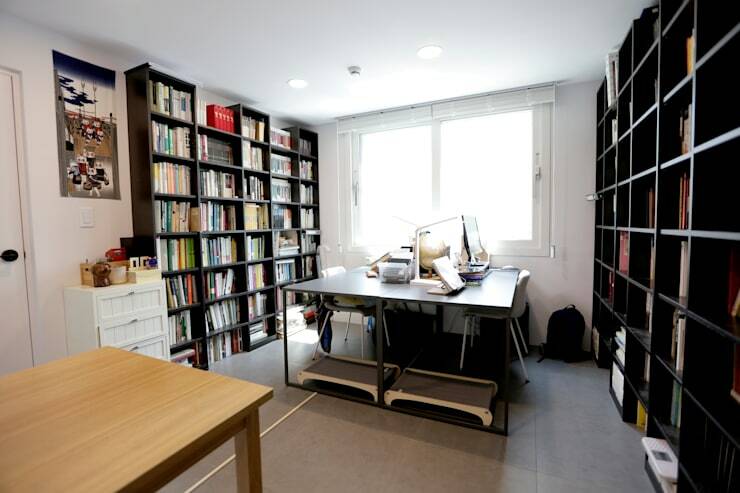 The desks have also been strategically positioned so that they allow flow throughout the room, where everyone can get to the bookshelves if need be. The large glass window naturally warms up this room and makes it that much more cheerful, bright and light. If we head into the bedroom, we really get a sense of how less is more. The designers have included only the bare necessities in this room and yet it is a little cosy haven that makes you want to have a nap just looking at it. 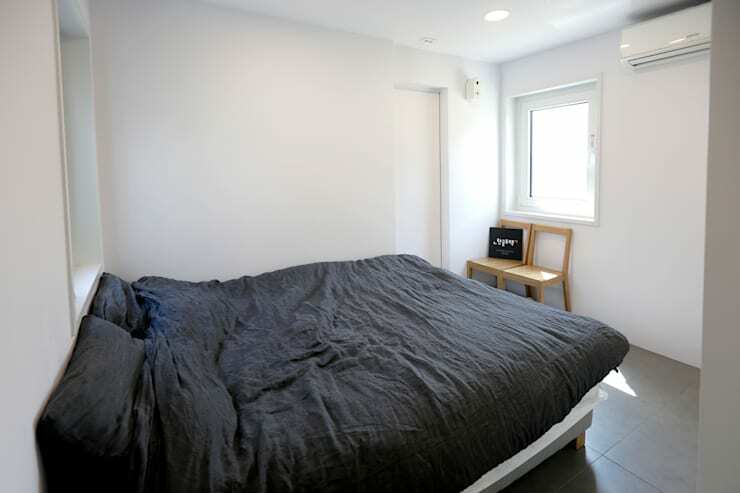 The bed linen is cushy and soft while the colours are neutral, ensuring that this space promotes peace and tranquility. Two little chairs in the corner of the room double up as functional items and decor items.